← ‘Red Velvet’ cake (courtesy of Blazeys of Bideford). All sorts of habitats have been affected by the floods this winter, and in many places it’s the human habitation in low lying areas that has been the most spectacularly damaged. the long term. If anyone had the time to take aerial photographs of the estuary at the peak of the floods they would have shown the coloured river water fanning out into Bideford Bay on the falling tide, and all that suspended soil will have sunk down to the sea bed carrying nutrients, and fertilisers, with it to contribute to further algal blooms in the hot summer we confidently anticipate for next year. One habitat that might be expected to be little affected by floods is that of the salt marshes that line the estuary and the tidal reaches of the rivers further upstream. After all, they are routinely flooded by the spring tides twice a month, and their special flora depends on this regular inundation with salt water. But while they are quite happy to be flooded, the salt marshes in the upper tidal reaches have suffered from the excessive rains of recent summers, because no sooner than they get their regular soaking with salt water than down comes the rain and washes all the salt away again. Thus the special salt marsh plants like the little pink-flowered sea spurrey and the tasty samphire, that are specially adapted to thrive in a saline environment, are being smothered by coarse meadow grasses that could not survive under normal salt marsh conditions. So, while all the tourist attractions are hoping for a hot, sunny, and above all dry, summer in 2013, their hopes are shared by the wildlife that depends on the salt marshes. 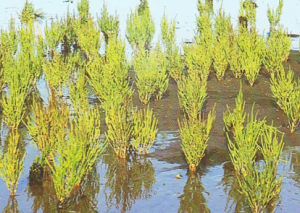 A good soaking in salt water every spring tide, and then left to dry out for the intervening weeks, will result in the special salt marsh plants spreading and the invasive coarse grasses dying out, to the benefit of all the salt marsh community. Nice that the people and the wildlife can share the same desires once in a while ! This entry was posted in Environment and tagged bideford, flooding, river Torridge, salt marsh. Bookmark the permalink.